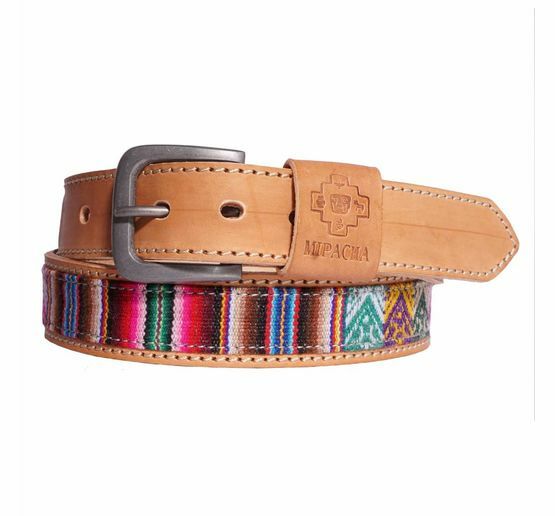 This handmade belt crafted by Peruvian artisans displays typical South-American textiles inspired by the stunning landscapes and vibrant culture of Peru. It features a solid gunmetal buckle and the typical MIPACHA logo embossed in the premium quality leather. Tip: How to determine the right belt size? Do not measure the belt from end to end - you will not get the accurate size that way. Measure a belt you currently wear. Start from the point where the buckle attaches to the belt (leather wraps around the buckle) to the hole you are currently using. If this measurement is for example 95 cm, order a size 95 cm. Our belts have 5 holes and are sized to the center hole. Fitting a belt to the center hole is important as it gives you the most flexibility with your belt.